GoXtra News: Applications now open for the Franz Kemp Award and Internships for Excellence in Magazine Journalism! Applications now open for the Franz Kemp Award and Internships for Excellence in Magazine Journalism! It’s now the time for Journalism students to apply for the Franz Kemp Award and Internships for excellence in magazine journalism. Applicants stand the chance to be one of three students who will experience a year-long paid internship at Huisgenoot, YOU and DRUM. “What made this internship great is that we got the opportunity to write and work like qualified journalists, alongside talented and experienced journalists; journalists who knew Mr Franz Kemp and his work ethics. 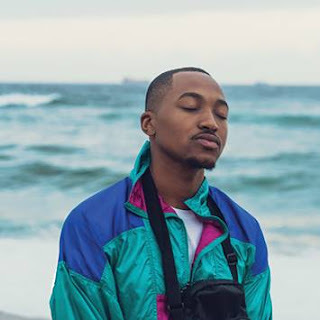 I am grateful for this and I will carry all the experience I have gathered from YOU magazine with me throughout my journalism career,” says 22 year-old Katlego Mhkwanazi of Saulsville, Pretoria, who is currently completing her internship. She completed her Honours degree in Journalism at the University of Pretoria. “The Franz Kemp Award made it possible for me to prove myself at a really successful magazine, despite not having any prior work experience. To be part of such a dynamic newsroom with so many different sections was a unique experience for which I am incredibly grateful,” says Suzaan Hauman (28) of Port Elizabeth, another one of the students completing her internship at the moment. She did her degree in Journalism at the University of Stellenbosch. The award, managed by Huisgenoot, YOU and DRUM, was established to celebrate the life and career of one of Media24 Weekly Magazines’ most gifted journalists. Kemp started his career as a journalist in 1957 at the newspaper then known as Oosterlig (now Die Burger Oos-Kaap). In the nearly fifty years that followed, he also worked at Volksblad and the Sunday paper of Die Beeld (later Rapport). He also worked as correspondent for the Afrikaans papers of Naspers (now Media24) in London and Washington. Kemp joined the Huisgenoot and YOU team in 1987 and was soon scoring top scoops for the magazines. He only retired as Gauteng bureau chief of Huisgenoot, YOU and DRUM in 2007, after which he spent three months in Sudan, training young journalists. He shared his Sudanese experience in a book titled 60 Dae in Suid-Soedan (60 Days in Southern Sudan), and sadly passed away less than a year later on 6 March 2011. His colleagues at Huisgenoot, YOU and DRUM remember Kemp as a mentor and a newshound. He is particularly fondly remembered for his 20 years as Gauteng bureau chief of Huisgenoot, YOU and, later, DRUM – decades during which he helped teach, shape and inspire many a young journalist. Telephone journalism won’t get you anywhere. Get in your car and go to the story. When you get there, place your right foot gently in the doorway, so that the door can’t be slammed in your face. Try to get into the living room. Don’t leave, even if you’re told you’re wasting your time. Often, the person you want to speak to will give in just because you’re there and refuse to go away. Don’t make judgments. You’re there to tell a story. 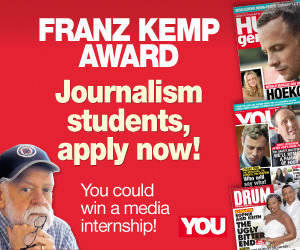 The Franz Kemp Award for excellence in magazine journalism includes three year-long internships at market-related salaries at Huisgenoot, YOU and DRUM for students with a qualification in journalism and a special flair for magazine journalism. A R30 000 cash prize will be given to the winning intern, judged on the work done during the internship. Students studying journalism at any tertiary institution are invited to apply for the award. If you want to apply, please forward a two-page CV, two examples of your news and/or feature writing and a reference letter from one of your lecturers to Kirthi Lalbahadur atkirthi.lalbahadur@media24.com with the words “HYD – Internship application” in the subject line. Closing date: 19 September 2013. Applications may be in English or Afrikaans.